Really, there’s no good reason for devs to not adopt HTTPS certification. The added protection makes you and your users safer, and ensures that you can guarantee that your website doesn’t inject malicious malware, tracking or unwanted ads onto your user experience. The Electronic Frontier Foundation developed its ‘Let’s Encrypt’ tool to make HTTPS certification faster, easier and free for anyone to use. Developed with sponsorship from Mozilla, the University of Michigan, Cisco, Akamai and others, the tool is now in Public Beta, which means that anyone with a website can set up the automated process to get an HTTPS certificate. According to the EFF, the process of adopting HTTPS has historically been difficult, and incurs cost on the website’s owner. By creating an automated tool, the barriers to HTTPS no longer exist, and more websites will be safe overall. This launch is a Public Beta to indicate that, as much as today’s release makes setting up HTTPS easier, we still want to make a lot more improvements towards our ideal of fully automated server setup and renewal. Our roadmap includes may features including options for complete automation of certificate renewal, support for automatic configuration of more kinds of servers (such as Nginx, postfix, exim, or dovecot), and tools to help guide users through the configuration of important Web security features such as HSTS,upgrade-insecure-requests, and OCSP Stapling. 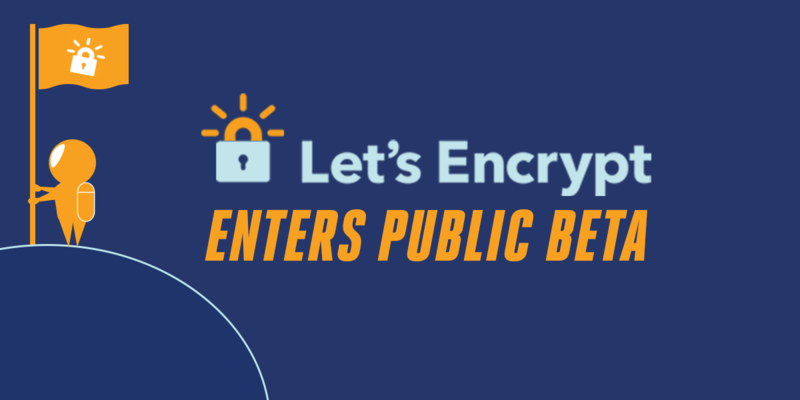 Users can run the beta client now, or contribute to the health of ‘Let’s Encrypt’ on the tool’s community site.